On Main St. in Galena, KS, the Jefferson Highway and Route 66 briefly share the road (2011). 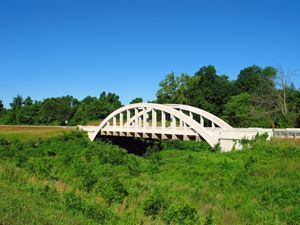 The Brush Creek Bridge is a Marsh Rainbow Arch bridge located on both the Jefferson Highway and Route 66 between Riverton and Baxter Springs, KS. 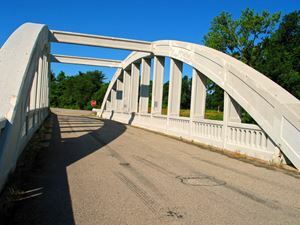 A bridge along an abandoned section of Main Street (Jefferson Highway) just north of Carthage, MO looking south. An abandoned section of Main Street (Jefferson Highway) just north of Carthage, MO looking south. 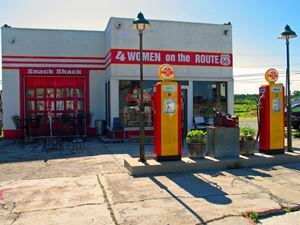 Old gas station along the Jefferson Highway (Garrison Ave) just north of Carthage, MO.